Elvis Presley died 32 years ago yesterday (August 16). Preoccupied as it was with selling Woodstock this past weekend, the mass media failed to commemorate Elvis’s death with similar aplomb. 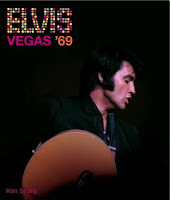 Indeed, so far as I know, there was no mention of the fact that while the Woodstock festival as going on, precisely at the same time, Elvis was at the International Hotel in Las Vegas in the midst of doing four weeks of sold out shows, making some of the finest music of his career. (His successful return to the stage is the subject of an excellent new book by Ken Sharp, pictured at the left.) By the end of October 1969, “Suspicious Minds” would reach No. 1 in the charts, the culmination of Elvis’s so-called “comeback” after eight years of making largely mediocre films—25 of them since he was discharged from the Army in 1960. He made 27 films 1960-69, but The Trouble With Girls would not be released until September 1969, and Change of Habit, his final dramatic feature film, would not be released until November. For those who care, Elvis Presley shall always be a daunting hermeneutic enigma. The Woodstock festival and Elvis are similar in that they have both become collective representations, but the fact is, the Woodstock festival simply doesn’t hold the same daunting, elusive mystery as Elvis does. In his book, Dead Elvis: A Chronicle of a Cultural Obsession, Greil Marcus calls the invention of dead Elvis, “a great common art project, the work of scores of people operating independently of each other, linked only by their determination to solve the same problem: who was he, and why do I still care?” Because dead Elvis is a collective representation, it both legitimizes and subverts “Elvis” the man. Perhaps the whole issue is irrelevant, except that Marcus can’t get past the vast amount of cultural expenditure invested in constructing dead Elvis. Nor can I. But a great deal of cultural production has gone into the invention of “Woodstock” as well, and the event, too, has been both legitimized, and subverted, the past four decades. The difference between the two cultural emblems, though, is that dead Elvis is largely perceived as an exemplar of tastelessness (inauthenticity), while Woodstock is perceived as a genuine expression of cultural yearning (authenticity), of a generation’s “innocence.” What are the reasons for these distinct cultural perceptions? Her final, acute insight is painfully true: by saying that Elvis could escape nothing, she means escape the Southern mythology, both what he inherited as a Southerner by birth, and what someone from the South is perceived to be by non-Southerners. The contempt for his Southern cracker origins may have been why he was never allowed to be the great actor he could have been. Even Jimmy Carter as president couldn’t escape the stigma of being from the South: the mass media was brutal on him, his brother Billy, and even his daughter Amy. It is widely accepted as fact that over the years many people have claimed to have been at Woodstock although they actually were not, as if being there is a badge of honor, symbolic cultural capital like having received a wartime medal of valor. One wonders whether Woodstock would still have its aura had it been held in Mississippi or Alabama. I suspect not, for “Woodstock” has had the fortune of being attached to no place (it wasn’t actually in Woodstock, it was on a farm), while in contrast, Elvis has never escaped the widespread stigma of being from the South. Google Generation Jones, and you’ll see it’s gotten a ton of media attention, and many top commentators from many top publications and networks (Washington Post, Time magazine, NBC, Newsweek, ABC, etc.) now specifically use this term. In fact, the Associated Press' annual Trend Report forcast the Rise of Generation Jones as the #1 trend of 2009.